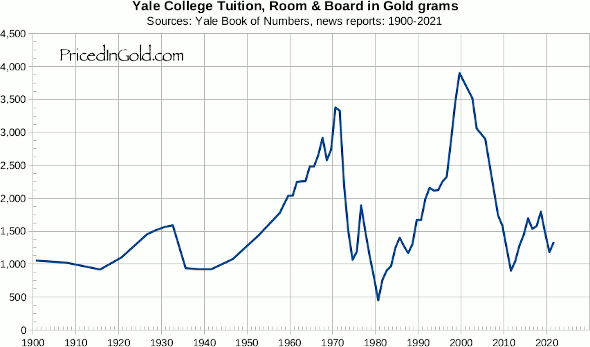 This chart shows the cost of tuition, room, and board at Yale College in grams of gold. Although the dollar cost of attending Yale has increased consistently over the years, the fluctuating value of the dollar has often created bargains for those using gold as their money. For example, in 2009, the cost of a year at Yale was almost the same as it was in 1932. But the rapidly falling value of the US Dollar makes prices for most things, including college, appear to be sky-high. In 1932, the cost was $1,056 for a year. In 2017, the cost was $66,900. Yet the true cost, measured in gold, was the same: around 1,600 grams – about average for the 115 year period. What will college costs be 10 years from now? No one knows for sure, but by saving for college in the form of gold, you can set a target and build towards it with confidence that when the time comes, that gold can be exchanged for whatever currency is needed to cover the costs.